The next version of Microsoft’s operating system is purportedly on view in two leaked screenshots. The Start menu in the alleged screenshot displays the new two-column format with shortcuts to your desktop applications on the left and with settings, live tiles, and other Metro — aka Modern — apps on the right. 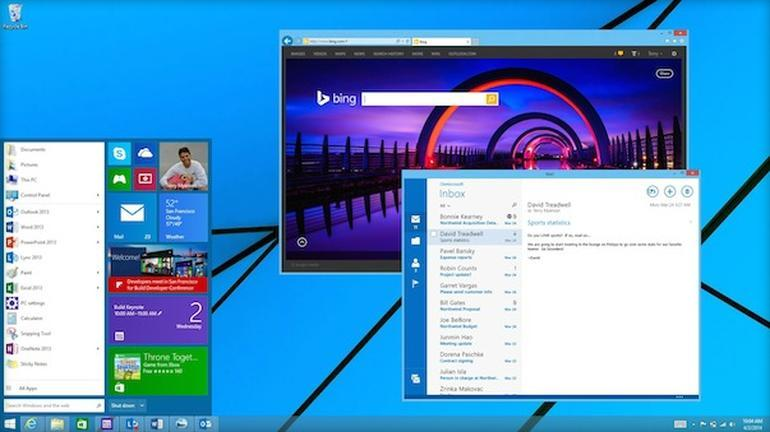 In this regard, it mimics the Start menu seen in the image above revealed by Microsoft in April and again in mid-July. The first screenshot does still show Windows 8.1 as the version. Microsoft initially planned to reintroduce the Start menu in the upcoming Windows 8.1 Update 2 but then changed its mind. So far, the next version of Windows is codenamed Threshold, which may officially be renamed Windows 9. Whatever it’s called, the next version of Windows with the Start menu in tow is expected to arrive in April. Although the features seen in the screenshots are likely destined for Windows Threshold, the screenshots themselves may or may not be the real deal. Myce didn’t say where or how it obtained the screenshots. The site said it believes the images to be legit but still advised people to take them with the usual grain of salt. Assuming the screenshots are for real, the Windows build depicted was compiled on July 13 and purportedly comes from the Microsoft team responsible for the Start menu, apps displayed in resizable windows, and other changes to the user interface.